NOTE: - Put on gloves to protect your hands. .
- Take care not to bend or scratch the panel. - Use the appropriate tool from the KTC trim tool set to avoid damage when removing components. 1. Remove the trunk lid trim panel (A). -1. Remove the clips (B,C). -2. Pass the trunk lid hinges (D) through the slits (E) on both sides. -3. Pass the trunk lid handle IF! through the hole (G). 2. 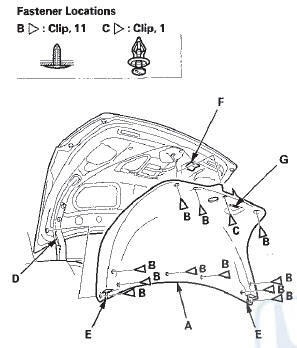 Pivot the trunk lid handle (A) down on the forward hooks (B) while prying the rear hook (C), then remove the handle. 3. Install the panel in the reverse order of removal, and note these items: - If the clips are damaged or stress-whitened, replace them with new ones.